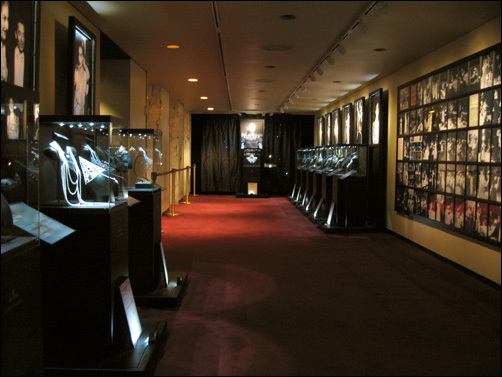 At the NYC MET Opera house, if you enter the "Maria Callas & Swarovski: Jewels on Stage" exhibit from the outside doors (across from the gift shop on the subterranean level), make sure to first go to the exhibit space on the left. 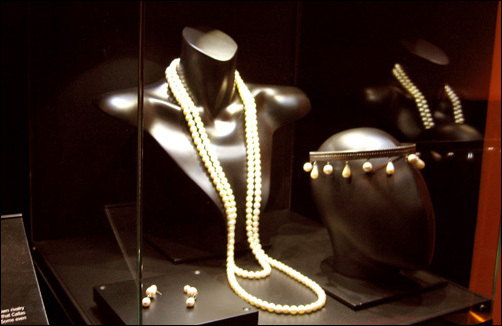 That way, the full impact of the stunning jewels on the other side of the exhibit will leave you reeling. Think of it as low-key (but elegant) aperitivo at Fioraio Bianchi Caffè before an unhurried dinner at the fabulous da Giacomo. From her debut on August 2, 1947 singing the lead role in Ponchielli’s La Gioconda in Verona, Maria Callas rawked Swarovski onstage in over forty-two different operas (four more recorded in the studio), and six-hundred performances, until her final appearance in 1965's London Tosca. Since Swarovski is so inextricably linked to the Callas legacy, they have brilliantly commissioned a stunning exhibition that showcases more than forty pieces (forty-three says the MET) of jewels that Callas wore throughout her career. 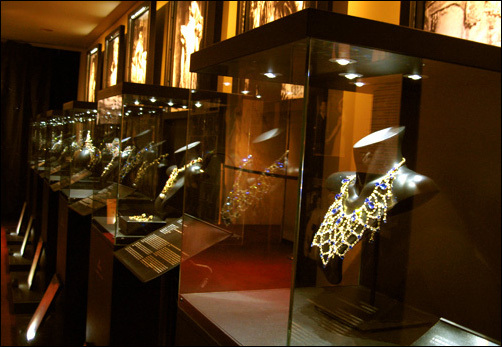 Although the exhibit has been swapped around Europe for a few years, this is the first time the jewels have been displayed in the USA, and currently runs until March 3, 2007 in the NYC MET Opera House's Founders Hall (in the subterranean basement where the little bronze head of Bing and Wagner's lonely neckbeard usually take-up residence). Admission is free, and you get an awesomely designed/printed catalog. 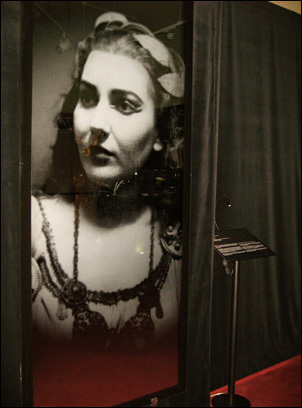 The exhibit features a smattering of full-panel etched glass mirrors stamped with Callas' ghost captured in various roles. Trapped behind the glass are displayed the corresponding bling, which illuminate via lights on timers. Callas is represented democratically throughout all stages of her career: fat, bloated, tapeworm-thin, haughty, elegant...the chameleon Callas. 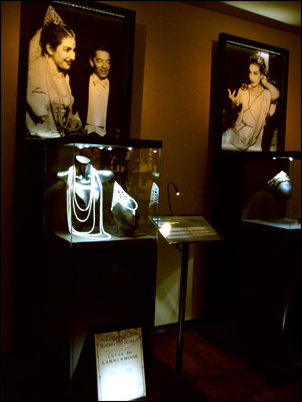 The exhibition has been carefully and thoroughly designed: silicone grey busts rest inside glass cubes, which are draped in Callas’ stage jewels. 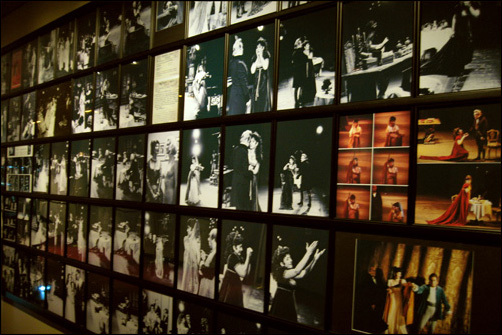 Behind the displays are black and white photos of la diva Callas in said jewels performing (or socializing) within the designated roles. At the base of the glass-stands are placards from the venue. There are also tons of archival photos and other Callas memorabilia -- from her Milan home on via Buonarroti, to a Western Union Telegram from Callas to Bing. Then there's the wall text: it is well-thought-out, and packed with rare anecdotes, but with over-usage of the word “magnificent”. I have no idea why, but in one panel, the word "magnificent" appears like seven times. The writers used every imaginable thesaurus entry for “shiny” in the copy -- gleaming, dazzling, twinkling, electrifying, and glassy -- dot the text like ants at a picnic. Some of the lingo was just too much, such as that for the bustier necklace from the May 1955 La Traviata. 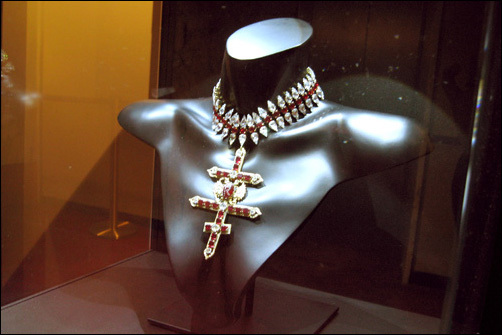 It reads, "The jewelry, encrusted with magnificent Swarovski crystal stones, captured and refracted the light, just like the thousand different facets of Maria's portrayal of Traviata”. heh. If you follow my instructions, and start to the smaller room on the left, you begin humbly with Callas' jewels from the April 14, 1957 La Scala Gavazzeni-conducted Donizetti's Anna Bolena; then the November 19, 1953 Trieste Votto-conducted Bellini's Norma; then the March 5, 1955 La Scala Lenny-conducted Bellini's La Sonnambula; then the February 26, 1947 Roma Teatro dell'Opera Serafin-conducted Wagner's Parsifal; ending with the very first Callas/Swarovski teaming of the August 2, 1947 Verona Serafin-conducted Ponchielli's La Gioconda...infinity jinx jinx jinx...I mean, I could go on, so you should prolly just check it out yourselves. 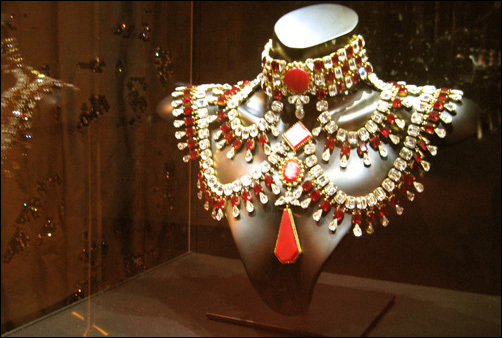 The necklaces, earrings, and bracelets are so convincing of real gems, as opposed to the crystal they are crafted from. Stage jewelry never looked so real. In fact, there are quite a few anecdotes verbalized how Callas was continually stopped at border crossings by incredulous border control, refusing to believe that the costume pieces were not real jewels. One sore point: there is a "conceptual work" that shows on a large plasma screen at the crux of the exhibit space: The video loop is a tedious, three-part work, featuring a cello overture by Michael Hammers, which is followed by a super-lame and annoying heartbeat interlude. The last is a statement recognizing validity of Masuru Emoto, a Japanese scientist. Emoto observed that the structure of water turns crystalline when water is exposed to the voice of Maria Callas, so there's a materialization of a close-up of water under a microscope slowly crystallizing, as Callas' “Casta Diva” plays in the background. Lame, lame and lamer. "Aware of the intense rivalry between Maria Callas and Renata Tebaldi, Benois contrived to have the women both appear on stage at different times wearing the same jewelry. 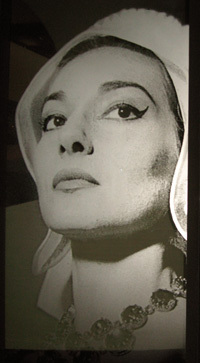 So the Orthodox cross of Fedora was worn by Callas at La Scala in 1956, and then, shortly afterwards by Renate Tebaldi at the Teatro San Carlo in Naples. The two artists never discovered who had played the practical joke on them. Then there’s the gigantic, um, monstrosity at the very back wall from the May 28, 1955 La Scala Giulini-conducted (YES!!) Verdi’s La Traviata. Last I checked, the MET Gift Shop had copies of curator/designer Rinaldo Albanesi's book, "Maria Callas: Gioielli di scene". The jewels themselves are not allowed to leave the exhibition space (so a glass-cutter, Taser, black ski mask, and a large canvas sack with "$" painted on it is optional). Discretion is advised.